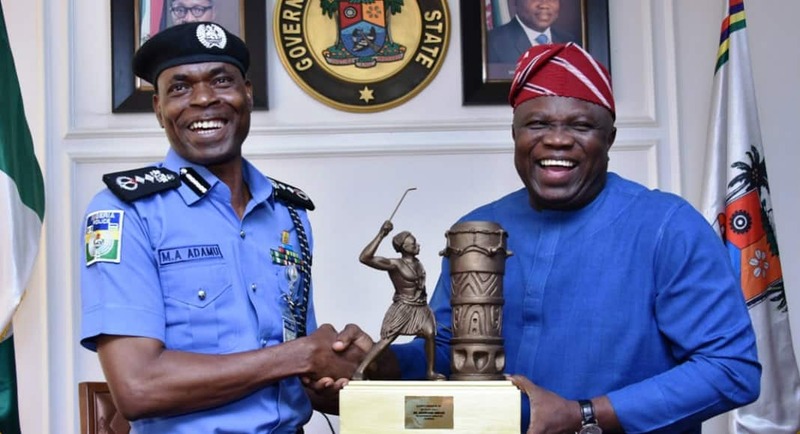 The Inspector General of Police (IGP), Adamu Mohammed, on Monday, April 15, visited Governor Akinwunmi Ambode of Lagos over recent cases of extra-judicial killings recorded in the state. Mohammed vowed that all the affected officers would be charged to court and made to face the full wrath of the law. Mohammed, who was accompanied on the visit by top police chiefs, noted that the affected officers had been arrested and tried internally, but that they would also face criminal prosecution for such act, which according to him, was against ethics of the force. According to the IGP, it was on record that police officers in the state have been performing creditably well, but that the activities of few unscrupulous ones were denting the good work of others. He said he was in Lagos to see the officers and men of the Nigeria police and to talk to them on good behaviour as well as remind them of ethics of the job. “We are to serve members of the public; we are not their masters, we are their servants. The IGP further commended Governor Ambode for the massive support to police and other security agencies in the state, saying the successes recorded in keeping the State safe would not have been possible if not for the support of the Governor. “I want to thank Governor Ambode for all his support to the members of the Nigerian police in Lagos state. Without the support of the Governor, I think the successes we recorded in the state, would not have been possible. “The governor is the Chief Security Officer (CSO) in the state and all his policies towards fighting crime have been implemented by the Nigeria Folice Force and we felt this is the time to come and thank him,” Mohammed said. In his response, Governor Ambode commended the IGP for making effort to promptly address the extra-judicial killings in the state personally despite his responsibilities across the country. He said the IGP’s action showed responsiveness and seriousness with which the issue was being handled by the police chief. “So, for the IG to come promptly himself to address issues that relate to public feelings about SARS and actually talking to the officers and men, that means he is taking the responsiveness within the Nigerian police seriously before we start to address extra issues that border on the citizens. So, I like to commend him on that act of responsiveness and also say that it is what we should emulate in dealing with management issues that relate with our officers,” he said. Ambode, who noted that securing Nigeria is tough, added that with just 33,000 officers policing a population of about 24 million in Lagos, the law enforcement agency was already overstretched. He, however, assured that the state government would continue to support the police and other security agencies to ensure that they carry out their duties lawfully and also to have the human face needed to continue to uphold peace and unity in the country.